Collects Astonishing Tales: Boom Boom and Elsa, Legion of Monsters (2011) 1-4, Marvel Presents 1-2, &amp; the Monster Hunters; material from Marvel Assistant-Sized Spectacular 2, Girl Comics (2010) 2, Rampaging Hulk (1977) 1-6, 8. The MUs most marvelous monster-hunter, unleashed! And shes brought along a few friends... 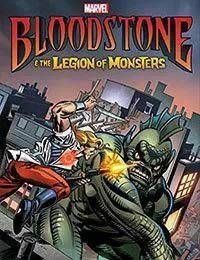 When young Elsa Bloodstone learns that her father was the legendary creature-killer, Ulysses Bloodstone, she soon discovers that blood runs thicker than water! With her fathers powerful gem around her neck, Elsa takes up the family business - so look out Dracula and the rest! Watch Elsa Bloodstone kick beastly behind with her NextWave pal Boom Boom, and her own friendly set of groovy ghoulies, the Legion of Monsters! Plus, discover the full Bloodstone legacy with astonishing tales from the files of Ulysses himself!